It's at its best when used alongside Reason, but this is a very solid start for Record. Rock-solid audio engine. Easy, familiar workspace. 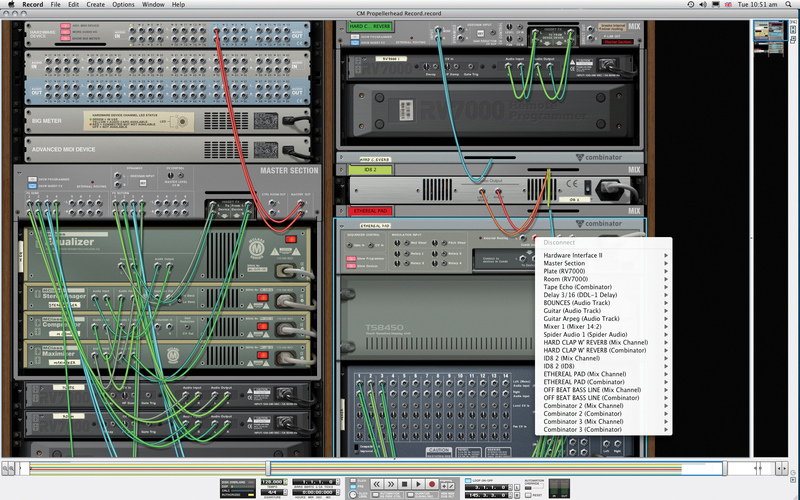 Seamless Reason integration. Excellent SSL-style mixer. Owner-friendly authorisation system. No third-party plug-in support. Not as comprehensive as major DAWs. Needs Reason to feel 'complete'. Propellerhead Software's Reason has established itself as the definitive self-contained electronic music programming suite. But if you wanted to extend your Reason productions to include audio tracks, your only real option has been to use a separate DAW, either exporting all the parts as audio or slaving using ReWire - hardly ideal. Finally, though, Propellerhead has designed its own multitrack audio system and the name of that beast is Record. Like Reason, Record is a self-contained program, but if you own Reason too, then the two products 'merge' into one - more on this later. Record enables you to do many typical DAW tasks such as recording, editing and mixing of audio, and programming, editing and arranging of MIDI for its built-in instrument, with maximum track capabilities only limited by your CPU. However, there are a number of things that mark it out from the majority of DAWs. First up, like Reason, it doesn't support plug-in systems such as VST, and it's important to appreciate that this is a deliberate part of Propellerhead's ethos. Next, although Record includes many effects, it only has one synth: the ID8 workstation. This 'songwriter's toolbox' covers typical workstation territory (drums, piano, bass, keys, etc), but if you want serious synthesis options, you'll want Reason 4 as well. 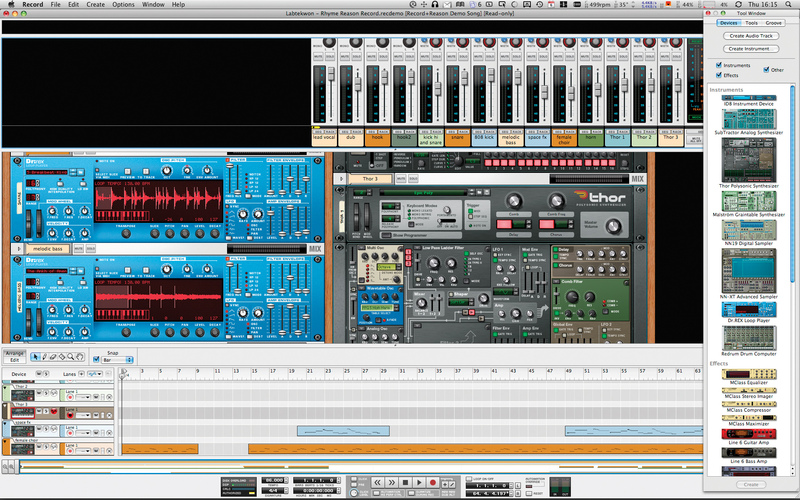 "First up, like Reason, it doesn't support plug-in systems such as VST, and it's important to appreciate that this is a deliberate part of Propellerhead's ethos." Although Record has good MIDI capabilities and can be controlled extensively using external devices and keyboards, it doesn't actually send MIDI on a track-by-track basis like a typical DAW. So, if you want to trigger external MIDI devices, you'll have to ReWire it into another DAW. Record offers not only real-time multiple sample rate support (you can combine file types within a session and they'll all play correctly), but also automatic timestretching. With Stretch enabled, any audio recorded is BPM-tagged, so it will match any tempo changes, and imported audio can be made to conform too. Although Record ploughs its own furrow conceptually, it does have some very familiar aspects. The interface consists of three main areas, the first being a typical arrangement page, in which all audio and MIDI clips are handled. The second element is the mixer, while the third is a rack of virtual effects, instruments and devices, providing both editing of device parameters and, if you flip it round, virtual patching, à la Reason. These three areas are accessed using the function keys F5, F6 and F7 and by default are designed to sit one above the other in order. You can resize the windows vertically or choose to see just one or two of them, in which case they expand to fill the available space. Each window has a vertical overview navigator strip down the right-hand side, with the mixer and sequencer sporting horizontal navigators too. The sequencer also gets horizontal and vertical zoom. However, the really nice feature is that you can simply hover your cursor over the window you want and use the mouse wheel to navigate. If you feel the one-window workspace is too restrictive for your needs, you can detach the mixer and rack windows, enabling you to build a more complex workspace of your own design. Two further floating windows can be introduced to the workspace. 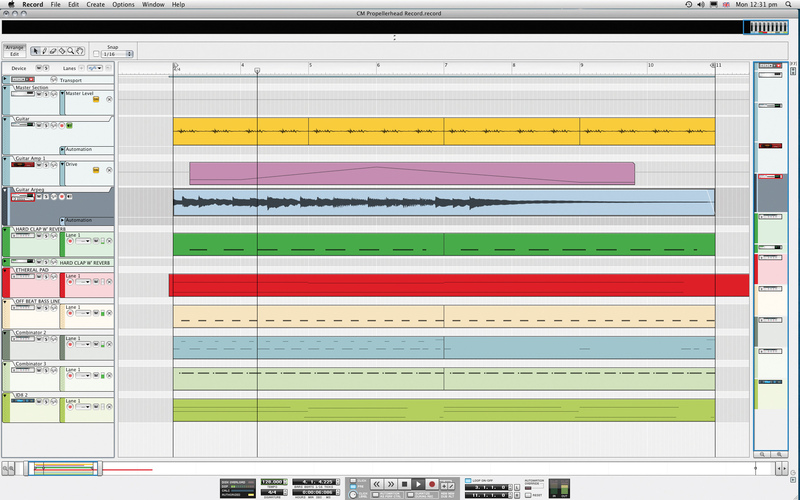 One is the Tools window, which features Devices, Tools and Groove tabs for creating new devices, fine-tuning sequencer data and setting groove parameters. The second window is the on-screen piano keyboard, which can be triggered by clicking or via your QWERTY keyboard. 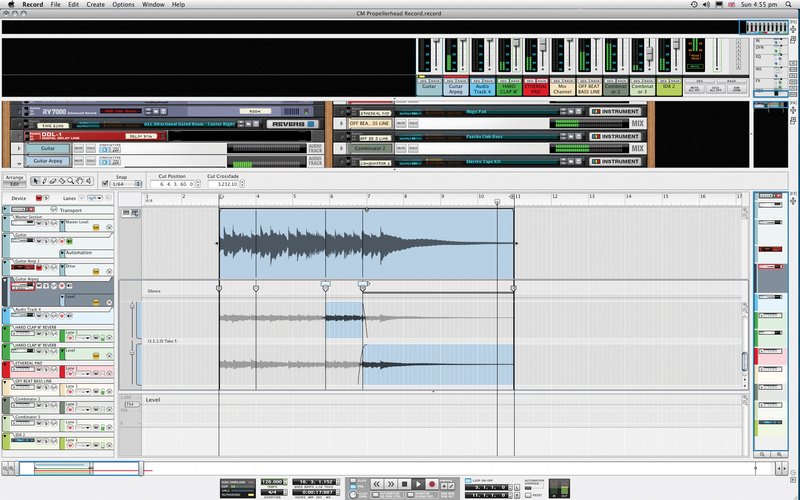 In essence, a single audio track comprises a sequencer track, an audio track rack device and a channel in the main mixer. The rack and sequencer are like Reason's, except that Record's sequencer handles both audio and MIDI, and the rack is spread across the screen rather than being one tall unit. You can patch things any way you want, then, but out of the box, new channels default to a sensible routing. The mixer is entirely different from those you may have used in Reason (which can still be called up, if you have Reason installed). It's modelled on SSL's 9000K analogue desk, according to Propellerhead (although it's not in any way endorsed or approved by SSL). Clearly, this new mixer takes the pressure to perform off the regular rack plug-ins, providing spectacular SSL-style EQ and dynamics. For each channel, you get 4-band EQ (with 'E-Series' option), plus separate filters, input trim and phase reverse. You can also switch the filters to feed the dynamics sidechain (eg, so that the compressor doesn't 'see' the lowest bass frequencies, thus reducing pumping) and rearrange the signal flow. "The mixer takes the pressure to perform off the regular rack plug-ins, providing spectacular SSL-style EQ and dynamics." There are eight effects sends and an insert point, giving you access to the processing placed in the corresponding Mix Channel or Audio Track rack device. And, of course, Propellerhead has copied SSL's famous master bus compressor. The mixer certainly sounds the part and is comparable to any other emulation we've tried. On a functional note, elements can be folded away to make things tidier, and you can assign four rotary and four button soft controls to the insert parameters. These appear on the mixer for quick access. As mentioned, Record features many processing effects, most of which will be familiar to Reason users, including the simple DDL-1 delay and CF-101 flanger, the MClass processors (EQ, Stereo Imager, Compressor and Maximiser), and the RV7000 Reverb and Scream 4 Distortion. There are also various more functional 'rack' devices, including Audio Track, Mix Channel, Mixer 14:3, Line Mixer 6:2 and the Spider audio and CV merger/splitters. New additions are the Line 6 Guitar Amp and Bass Amp processors - which we'll get onto shortly - and, on the instrument front, the previously mentioned ID8. Finally, there's the Combinator device, which lets you combine various effects and instruments in one shell, allowing easy patch design and advanced routing and modulation. The majority of Record's bundled effects and instrument patches come as Combinators, some with their own custom skins. All good DAWs attempt to combine complex, powerful features with usability, and Record approaches this is in a simple and visual manner. You won't find confusing sub-menus, hidden windows or too many indecipherable icons, and any extra functions are typically accessed by right-clicking over the area concerned. The sequencer window employs a flexible lane approach (audio, note, parameter and pattern) for MIDI, audio and automation data, and its two modes - edit and arrange - switch between an 'all tracks' overview and a fully expanded, track-specific view. This is helpful for MIDI note editing or when recording audio in loop mode. Incidentally, the latter creates multiple takes within the same track with 'comp rows' enabling quick comping in a manner not unlike Logic's, where you see all the takes stacked on top of each other and use a tool to swipe the sections you want to use. 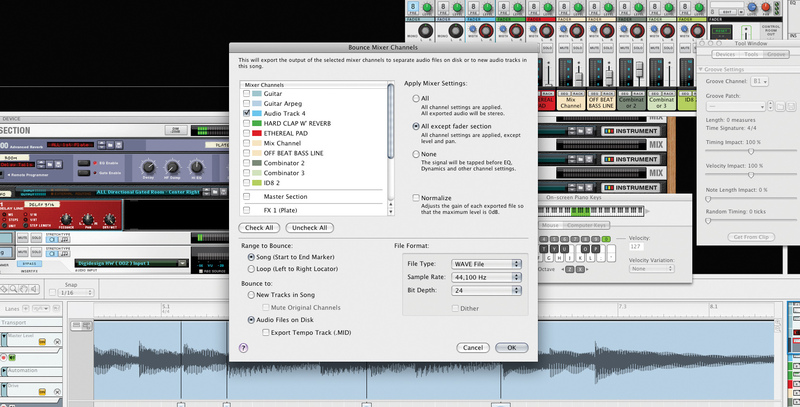 Also on the editing front, simple handles are used to crop, fade and level each audio clip. As mentioned, Record has two devices featuring virtual guitar and bass amps courtesy of simulation wizards Line 6. Choose your amp and cabinet, set the drive level and amp EQ, dial in compression for the bass amp and use volume and wah pedals on the guitar one. Furthermore, if you own a Line 6 product such as the POD Farm plug-in and/or one of their USB interfaces, you can call up additional amp models and tone presets that you already own. The Line 6 hardware works like a dongle in this case, and there are no extra editing functions, so you can't edit effects or advanced parameters. "All good DAWs attempt to combine complex, powerful features with usability, and Record approaches this is in a simple and visual manner." There are numerous other nice touches, like a visual tuner on each audio track when you arm it for recording; a floating tools window from which you can drag and drop new devices; 'go to' tabs on the mixer channels that highlight the corresponding device or sequencer track; pan and width controls for stereo mixer faders; and an auto-setup dialog for MIDI controllers. Record projects are saved as a single self-contained session file, which makes organisation easy but can gobble up disk space if you save different song versions. And from a universal perspective, the Bounce Mixer Channels option provides a 'one-click' option to export some or all of your tracks individually as audio, with or without processing. You'll appreciate this function if you want to transfer your Record projects to other DAWs. Record uses a USB copy protection dongle, dubbed the Ignition Key. Internet-connected registered users can authorise online if they forget their key and, failing that, the demo mode will do everything except open saved sessions. This is an excellent and owner-friendly system. If you're familiar with Reason you should find Record extremely simple to use; and if you own both programs, you'll have instant access to all your Reason devices within Record. What's more, you can open your existing Reason sessions in Record, and things will come up exactly as in Reason, with everything routed into a 14:2 mixer device, the stereo outputs of which go into Record's main mixer. If, however, you buy Record on its own, you'll find that many of its functions are wasted without Reason. For example, the fantastic ReGroove mixer, which enables you to rework MIDI parts, and the excellent CV patching that's ideal for synth heads won't be seeing much action without Reason installed. Furthermore, Reason Refills offer a route to third-party sample content, but because Record has no sampler as standard, you can't use them if you don't have Reason, and Propellerhead say that there are no plans to offer more content for ID8. Record is more likely to appeal to Reason users looking to expand their options than it is to new users after a one-stop production system. The good news is that the two are available bundled at a reduced price, with a Reason crossgrade option for Record owners in the pipeline. Record's aim is to provide a quick, musical approach to music production. As noted, its feature set doesn't put it in direct competition with big hitters like Logic and Cubase. However, Propellerhead would suggest that it can get you where you want to go with a lot less fuss and, in many respects, this is true, especially if you're not already familiar with typical DAWs. Unsurprisingly, integration with Reason 4 is seamless to the point where its synths and effects feel like a massive expansion pack, and together the pair make a formidable system. 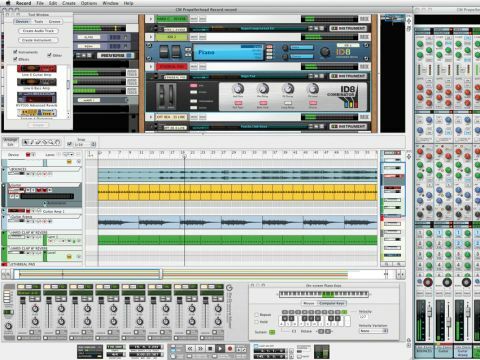 "If you're buying from scratch, you'll have to weigh up its easy workflow against the greater flexibility you would get in a traditional DAW such as Cubase." New software is often tainted by bugs or exaggerated claims, but Record feels very stable and accomplished. The audio engine seems particularly robust and the instant, real-time timestretching is so good that you can rely on it to take care of programmed tempo changes. As with all timestretching, there can be artefacts, and these are material dependent, but the quality of Record's timestretching is a major plus - it's probably the best we've heard. Overall, Record is at its best when used alongside Reason 4 and many Reason users will consider the discounted crossgrade essential. If you're buying from scratch, you'll have to weigh up its easy workflow against the greater flexibility you would get in a traditional DAW such as Cubase. This is a tough call and based very much on what sort of work you're doing. Even so, Record is an excellent package and especially impressive considering it's at version 1.